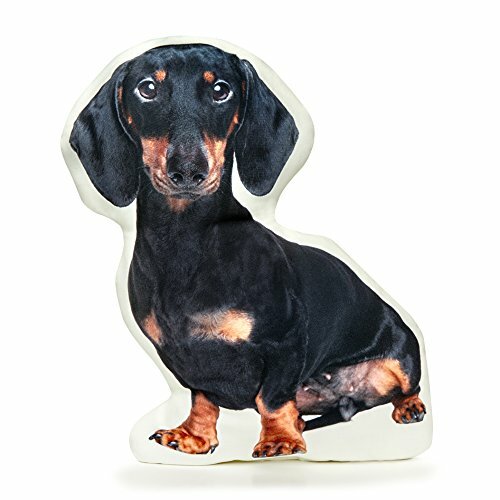 Cushion Co - Dachshund Black & Tan Shaped Pillow 16" x 12"
CUSHION CO. Dachshund Black and Tan shaped pillows for sleeping can brighten up each and every day. They are soft and ready for some major high-quality cuddling. Our animal cushions are more than cute and cuddly; they are made to last and last. Made from the BEST QUALITY lightweight canvas. Our cuddly animal body pillows are perfect for snuggling on your couch, resting on your bed or just helping you or your little ones catch a quick nap. In creating our unique and one-of-a-kind animal big cushion pillows, we have traveled across the globe selecting the very cutest animals from the farms, jungles and beyond. Our team of cuddle experts thoughtfully handpicked every single animal cushion to provide you with a trusted snuggle buddy that is perfect for your couch, bed or anywhere you need to curl up and unwind. View More In Decorative Pillows, Inserts & Covers. If you have any questions about this product by Cushion, contact us by completing and submitting the form below. If you are looking for a specif part number, please include it with your message. Cushion Co - French Bulldog Tan Shaped Pillow 16" x 12"
Cushion Co - French Bulldog Grey Shaped Pillow 16" x 12"